We use our smartphones for everything. We all watch TV on it. Facebook videos, movies, YouTube series, whatever. Although usually the smallest of small screens is fine for a quick video, some things were meant for a larger screen. 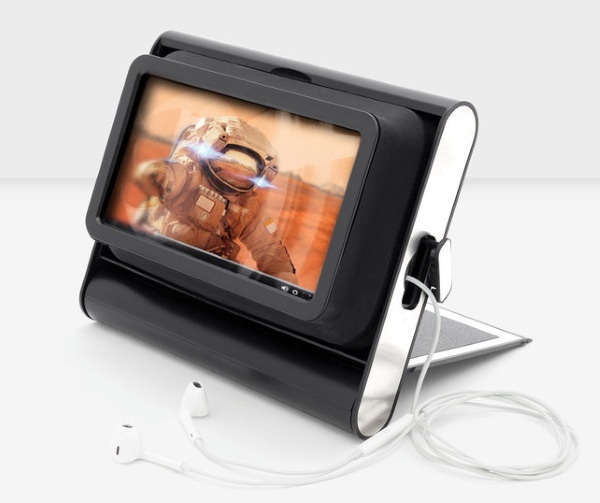 Check out the Magni-Viewer, to increase your screen size. This viewer works for all standard smartphones. If you happen to have a larger smartphone, then it may be too big for this device. Of course, if you have a larger phone, you probably don’t need something like this anyway. Perfect for long trips like plans and trains. Watch whatever you want on it from Netflix videos to movies YouTube upload. This is very easy to toss into a bag and just go. It also makes sharing a show with someone else while trying much easier. This device makes the show twice as large so you can see it that much easier. You can get your own for $29.29. There’s no information on the site that’s useful. “Makes phone screen twice as large…” I don’t even know what this means. Does it make a 5″ phone a 10″ screen? A 4″ phone an 8″ screen? From the lone image, it looks like a magnifying glass. What’s worse is that the image of the astronaut is both blurry and cut off. “Works unless you have a really large phone…” again, I don’t know what this means. What’s considered large? What size phones are acceptable? Also, if you need to pause a video, adjust sound, are back speakers muffled? Not being unnecessarily hard. It’s just one of the poorest and vaguest description I’ve seen for a product in a long time. It looked interesting but it feels like one would be tossing $30 away.